WASHINGTON (AP) — A juror in Paul Manafort’s financial fraud trial says a lone holdout prevented the jury from convicting the onetime Trump campaign chairman on all 18 counts. Jurors repeatedly tried to persuade the holdout to “look at the paper trail” but she insisted there was reasonable doubt, juror Paula Duncan told Fox News. The federal jury on Tuesday found Manafort guilty on eight counts; the judge declared a mistrial on 10 counts the jury was deadlocked on. She said the president’s administration did come up during deliberations because of testimony that Manafort had tried to secure a White House position for a banker who authorized millions of dollars in loans for him and had lobbied Trump son-in-law Jared Kushner. Duncan also said she would have liked to have heard more from Manafort’s defense. Manafort did not testify at trial and his lawyers conducted mostly limited questioning of the government’s witnesses. She also said the jury “agreed to throw out the testimony” of Manafort protege Rick Gates, who pleaded guilty in Mueller’s investigation and agreed to cooperate with investigators, and focus instead on the documents. Duncan’s comments in the interview Wednesday came the same day that the trial judge unsealed several transcripts of closed bench conferences. One transcript showed that the defense had privately sought a mistrial because of comments a juror was quoted as making about the weakness of Manafort’s defense. 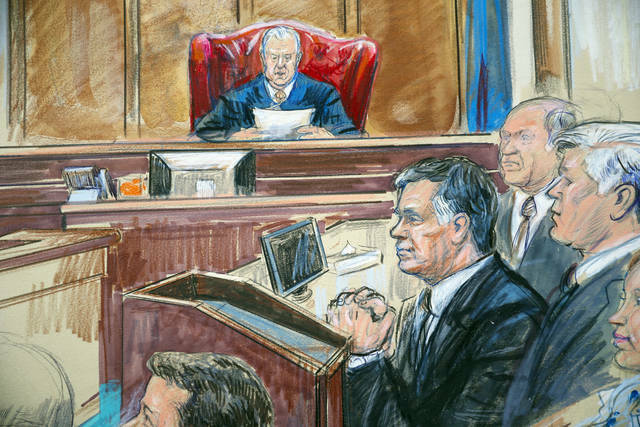 The disclosure by one juror of another juror’s remarks on the ninth day of Manafort’s trial prompted U.S. District Judge T.S. Ellis III to question jurors about whether the comment would affect their ability to make a fair and impartial verdict. Juror names are blacked out in the transcripts. Ellis denied Manafort’s motion, saying that after considering the circumstances carefully and questioning each juror about their ability to be impartial, a mistrial wasn’t warranted. Opinion: What’s Happening to Charitable Giving in This Country? At a time of staggering inequality and a fraying social safety net, charity can play a hugely important role in addressing urgent social needs. Instead, however, a growing number of extremely rich people are using charity mechanisms called donor-advised funds, or DAFs, to claim substantial tax benefits — often without actually supporting the charities addressing those needs. In “Warehousing Wealth,” a new report we’ve co-authored for the Institute for Policy Studies, we track the explosive growth of these accounts and their perils, and recommend some reforms. DAFs are holding accounts for high-dollar donors designated specifically for charitable giving. Originally a creation of community foundations, they’ve been adopted and aggressively marketed by a number of for-profit Wall Street firms: Fidelity Investments, Charles Schwab and Vanguard all now offer them. Donors can put money into a DAF — taking a tax deduction when they do so — and then later recommend grants from that DAF to qualified charities. Unfortunately, after the donor has claimed a substantial tax break, the funds may sit in the DAF for years — or potentially forever. There’s currently no legal incentive to move money to charities once it’s been put into a DAF. In fact, these Wall Street-sponsored DAFs often entail financial incentives for staff at the DAF, and for fund managers and client advisers at its for-profit affiliate, to keep money in the fund rather than donate it. DAFs are now the fastest-growing recipients of charitable giving in the United States. Donations to DAFs increased from just under $14 billion in 2012 to $23 billion in 2016 — growth of 66 percent over five years. In contrast, charitable giving by individual donors nationwide grew by just 15 percent over the same five years. In fact, DAFs appear to be shifting giving away from public charities. The share of total U.S. individual charitable giving that’s going to DAFs, rather than directly to public charities, has nearly doubled over the last seven years. In 2016, for the first time ever, a DAF — Fidelity Charitable Gift Fund — was the top single recipient of charitable giving in the United States, edging out the more traditionally charitable United Way. And in 2017, six of the top 10 recipients of charitable giving were DAFs. The problem is there’s no legal requirement for DAFs to pay out their funds to qualified charities — ever. According to one estimate, the average annual payout rate for DAFs in 2016 was just 20 percent, and some DAFs give considerably less than that. And even as the amount of funds flowing to DAFs has increased, payout rates have been steadily going down. As currently structured, DAFs foster a wealth preservation mentality among donors, rather than incentives to move donations to qualified charities. This delays the public benefit from those donations, which has an opportunity cost for society. DAFs also open up loopholes for both donors and private foundations to get around tax restrictions, and have little transparency and accountability. Because we subsidize charitable giving through the tax code, there’s a strong public interest in seeing those charitable funds deployed quickly to solve real community problems. There are simple reforms that could prevent these abuses. Lawmakers could require the distribution of DAF donations within a fixed number of years. They could delay the tax deduction until funds are paid out to a public charity. And they could ban DAFs from giving to private foundations, and vice versa — closing loopholes that further delay giving to active charities. There are significant risks to warehousing wealth in large financial institutions at a time of extreme wealth inequality and undisputed public need for the services charities provide. It’s imperative to correct the rules regulating these charitable vehicles to ensure the public good is justly served. Chuck Collins directs the program on inequality at the Institute for Policy Studies, where Helen Flannery is an associate fellow. They are co-authors of the IPS report “Warehousing Wealth: Donor-Advised Charity Funds Sequestering Billions in the Face of Growing Inequality.” They wrote this for InsideSources.com. Neil Visalvanich does not work for, consult, own shares in or receive funding from any company or organization that would benefit from this article, and has disclosed no relevant affiliations beyond their academic appointment. Opinion: What’s So Unsettling to Schumer About ‘Settled Law’? What’s so unsettling to Chuck Schumer about “settled law”? This is good news for the White House, because it indicates Collins is unlikely to break ranks and vote against Kavanaugh. Which means it’s bad news for Sen. Schumer and his party’s uphill fight to keep Kavanaugh off the court. And so, Schumer says, “settled law” doesn’t “settle” anything. So a nominee saying “settled law” simply isn’t good enough for Schumer. Except for when it is. Settled or unsettled, Schumer voted against Alito and Roberts anyway. This adds to the speculation that his complaints of a Kavanaugh “dodge” are in fact merely anti-Trump partisanship. “The real dodge is Senator Schumer dodging the fact that Supreme Court nominees, Republican and Democrat alike, do not answer questions that would prejudge issues that come before the court,” says Adam J. White, a professor at George Mason University’s Antonin Scalia Law School. “Surely the senator remembers Sonia Sotomayor — whom Schumer personally introduced at the beginning of her 2009 hearings — explaining why nominees should not prejudge issues,” White said. Known as the “Ginsburg Standard” after Justice Ruth Bader Ginsberg, nominees simply refused to answer detailed questions about specific cases or issues that might come before the court. Ginsberg was confirmed by a vote of 96-3. And it worked for Sotomayor, too. Senate Democrats, including Schumer, backed her unanimously in a 68-31 confirmation vote. Judge Brett Kavanaugh has a 12-year record on the D.C. Circuit Court of Appeals, and has written 300 opinions on cases covering virtually every aspect of jurisprudence. In addition, the Senate Judiciary Committee has received more than 430,000 pages of records to review — more than twice the number for any previous nominee. Ironically, after Schumer launched his attack on Kavanaugh, he refused to answer questions from reporters on any other subjects. Maybe Schumer was trying to dodge questions from reporters who understand the hypocrisy of his attacks on Republican nominees. Michael Graham is political editor of NH Journal. He is also a CBS News contributor. You can reach him at michael@insidesources.com. He wrote this for InsideSources.com.